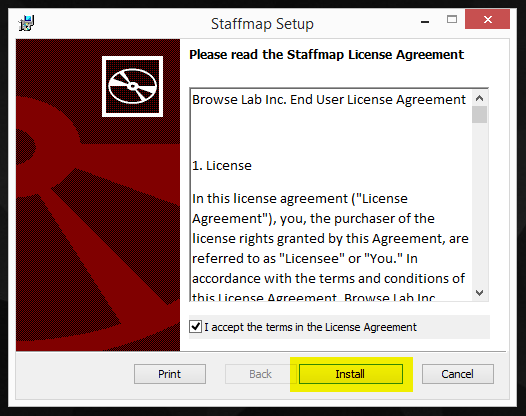 StaffMap will install to C:\Program Files\StaffMap 2 by default. You will be asked to accept the license agreement. Check 'I accept the terms in the License Agreement' and then click 'Install' to continue the installation. Setup is ready to begin installing. Click 'Install' to continue. 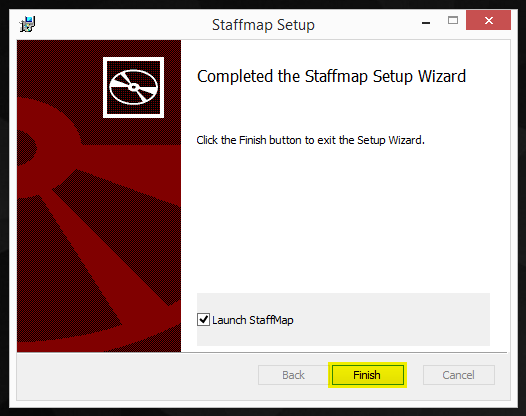 When complete, a message will appear indicating that the setup has finished installing StaffMap on your computer. Click 'Finish' to complete the installation. When you run StaffMap for the first time (you can find the executable file in your start menu), a browser installation file will run, completing the set up. You will see a status message on a white background in your browser. StaffMap can also be run by entering localhost/staffmap in your browser's URL bar. Try running StaffMap with the URL: “localhost/StaffMap2”. This will bypass any firewalls blocking StaffMap. If you are experiencing an Error (e.g. ERROR 500.21), go to the Knowledge Base and search for the Error Code for a guide.